BEIJING, CHINA--(Marketwired - Sep 25, 2017) - GTC China - NVIDIA (NASDAQ: NVDA) today announced that China's technology giants are adopting the new NVIDIA® Volta GPU computing platform to accelerate AI for a broad range of enterprise and consumer applications. Speaking at the GPU Technology Conference in Beijing, NVIDIA founder and CEO Jensen Huang announced that Alibaba Cloud, Baidu and Tencent are incorporating NVIDIA Tesla® V100 GPU accelerators into their data centers and cloud-service infrastructures. "AI is the most important technology development of our time, with the greatest potential to help society," Huang said. "As the world's leading cloud providers deploy the world's best AI platform, with Volta GPUs and NVIDIA software, we'll see amazing breakthroughs in medicine, autonomous transportation, precision manufacturing and much more." Alibaba Cloud, Baidu and Tencent are upgrading their massive data centers, shifting from NVIDIA Pascal™ architecture-based systems to Volta-based platforms, which offer extraordinary speed and scalability for AI inferencing and training. At the heart of the new Volta-based systems is the NVIDIA V100 data center GPU. Built with 21 billion transistors, it provides a 5x improvement over the preceding NVIDIA Pascal architecture P100 GPU accelerators, while delivering the equivalent performance of 100 CPUs for deep learning. This performance surpasses by 4x the improvements that Moore's law would have predicted over the same period of time. "Working closely with NVIDIA, we are taking full advantage of the power and efficiency of Volta to strengthen Baidu Cloud, Intelligent Driving and our other AI initiatives. By leaning into the most advanced AI technology available, we are accelerating the application of AI to create more opportunities for our customers and society as a whole." "With Alibaba Cloud's leading cloud computing capabilities and accelerating AI developments worldwide, we look forward to exploring enhanced AI-enabled services and cost-effective AI research and development by collaborating with NVIDIA and its Volta platform." -- Jin Li, vice president of Alibaba Cloud. "We use AI extensively on our products to improve the user experience, such as voice recognition in WeChat, augmented reality in QQ and Qzone, as well as providing data intelligence services on Tencent Cloud. Volta GPUs will enable our developers with unprecedented computing power to enhance our products, and we look forward to bringing the power of Volta with HGX to other businesses soon through Tencent Cloud." NVIDIA also announced that China's leading original equipment manufacturers -- including Inspur, Lenovo and Huawei -- are using the NVIDIA HGX reference architecture to offer Volta-based accelerated systems for hyperscale data centers. Certain statements in this press release including, but not limited to, statements as to: Alibaba Cloud, Baidu and Tencent adopting the new NVIDIA Volta GPU computing platform; the importance of AI; NVIDIA's ability to advance AI to help society; and the benefit, impact and performance of NVIDIA Volta-based platforms are forward-looking statements that are subject to risks and uncertainties that could cause results to be materially different than expectations. Important factors that could cause actual results to differ materially include: global economic conditions; our reliance on third parties to manufacture, assemble, package and test our products; the impact of technological development and competition; development of new products and technologies or enhancements to our existing product and technologies; market acceptance of our products or our partners' products; design, manufacturing or software defects; changes in consumer preferences or demands; changes in industry standards and interfaces; unexpected loss of performance of our products or technologies when integrated into systems; as well as other factors detailed from time to time in the reports NVIDIA files with the Securities and Exchange Commission, or SEC, including its Form 10-Q for the fiscal period ended July 30, 2017. Copies of reports filed with the SEC are posted on the company's website and are available from NVIDIA without charge. These forward-looking statements are not guarantees of future performance and speak only as of the date hereof, and, except as required by law, NVIDIA disclaims any obligation to update these forward-looking statements to reflect future events or circumstances. © 2017 NVIDIA Corporation. All rights reserved. NVIDIA, the NVIDIA logo, Pascal and Tesla are trademarks and/or registered trademarks of NVIDIA Corporation in the U.S. and other countries. Other company and product names may be trademarks of the respective companies with which they are associated. Features, pricing, availability and specifications are subject to change without notice. 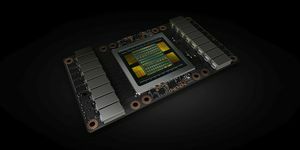 NVIDIA Tesla V100 GPUs accelerate AI for a broad range of enterprise and consumer applications.